The first of its kind, this elegant neoclassical-inspired coin is made exclusively by British luxury brand Wedgwood from one of the most prized and collectable ceramics in the world, featuring. Three Graces design celebrating 200th anniversary of world-renowned marble sculpture. 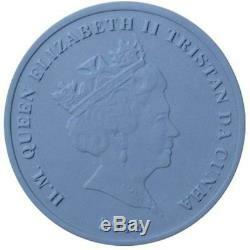 First legal tender coin made in Wedgwoods finest Jasperware. Highly collectable piece of ceramic craftsmanship. Wedgwood, one of Englands most esteemed luxury homeware and tableware brands, has leveraged 250 years experience in ceramic excellence to create the Jasperware Three Graces Coin. A unique innovation inspired by the companys rich neoclassical heritage, it is the first legal tender coin ever to be made in Jasperware, an historic Wedgwood stoneware that remains one of the most sought-after and collected ceramics in the world. 250 Years of Quality Craftsmanship. Josiah Wedgwood invented Jasperware in 1775 after several years of trial and error. Made from dense white stoneware that can be stained with mineral oxides to provide a range of different colours, it is fired at high temperatures of about 1,250 degrees Centigrade. Impervious to liquid without needing to be glazed first, it can be moulded, manipulated, embellished with applied ornamentation and polished to yield different decorative effects. Ornamental Jasperware pieces were the epitome of elegance and simplicity as a popular late 18th century fashion, inspired by the neoclassical revival of classical Greek and Roman architecture. A Wedgwood legacy, the Jasperware Collection represents over 250 years of the finest English craftsmanship, pioneered by experimentation, innovation and quality design since 1759. The coins reverse design is inspired by signature Wedgwood reliefs of The Three Graces, based on the classical myth of the three charities, which have appeared in several forms on Josiah Wedgwoods cameos since about 1777. The Jasperware Three Graces Coin also pays tribute to the worlds most famous depiction of The Three Graces - the neoclassical marble sculpture by Antonio Canova, which celebrates its 200th year on public display in 2018. The three mythological charities are said to be the daughters of Zeus, representing youth, mirth and elegance. The world-renowned sculpture is jointly owned by The National Gallery of Scotland and the Victoria & Albert Museum in London. 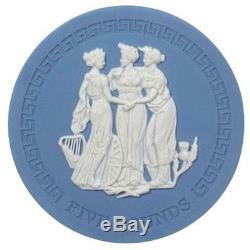 The Jasperware Three Graces Coin features an ornamental bas relief of Canovas The Three Graces in exquisite detail. Set against a pastel blue Jasperware base, the three female figures are bordered by geometrical shapes in a tribute to Greek neoclassical art. Also included on the reverse is an inscription of the coins monetary denomination FIVE POUNDS. 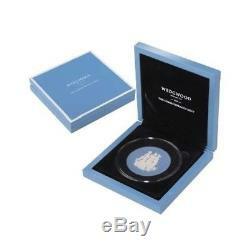 Each coin is supplied in an official luxury Wedgwood branded presentation box. 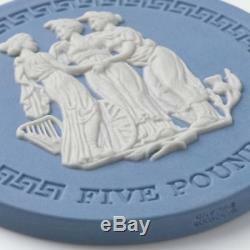 The item "2018 Wedgewood Jasperware Three Graces Handmade Coin" is in sale since Friday, December 14, 2018. This item is in the category "Pottery, Glass\Pottery, Porcelain\Wedgwood\Decorative, Ornamental". The seller is "coinsaustralia_official" and is located in Sydney, New South Wales.